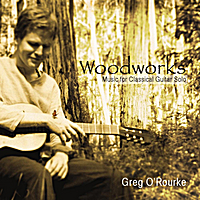 Works by Bach, Scarlatti and Spanish composers, masterfully performed by Australian guitarist Greg O’Rourke in his debut album for solo guitar. “The concept behind this album is very simple; it’s a collection of some of my favourite pieces for solo classical guitar that I have come back to play again and again over the years. From the ‘tug at the hearstrings’ melodies of Albeniz to the musical genius of J.S. Bach, all these works have a common thread: they are exquisitely beautiful, passionate and intelligent pieces of music. International award winning Australian guitarist Greg O’Rourke received his Bachelor Of Music Honours degree in 2006, and was a scholarship holder at the Australian National University School Of Music. Greg studied with Tim Kain, one of Australia’s leading classical guitar performers and teachers. He has also studied in master-classes with many prestigious performers including Remi Boucher, Anthony Field, Lily Aschfar, Carlo Barone, and Pavel Steidl. Greg has given prizewinning performances at the Australian National University Chamber Music Competition, and was awarded 1st prize in the Chamber Music division of the 2004 Australian International Guitar Competition. Greg currently enjoys a busy career, comprising of teaching, performing and collaborations with other Australian artists.